We’re starting to feel like old pros here. This morning we drove to a spot just north of Wakita, OK, a town noteworthy for having been featured in the 1996 film “Twister”. In the movie, the town is destroyed by a tornado. 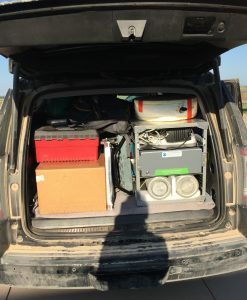 We parked at the end of a closed dirt road, set up our launcher and two AirCore payload strings and sent them off. The only unplanned event occurred when the second balloon prematurely busted out of the launcher – yikes! The Velcro rip cord wasn’t perfectly aligned and the wind was buffeting the balloon around. A couple of times we heard James say, “I can hear Velcro ripping” and Sonja would say, “OK….”, not registering the likelihood of the balloon escaping at any minute. Luckily Bianca and Sonja were tying off the balloon neck when it burst out of the tube, so Sonja just hung onto it (but watch everyone jump in the time-lapse video!) Surprise! Tracking and recovery went according to plan and back at the lab, Jack and Sonja packed up the vehicle like a good Tetris game while Bianca analyzed the three AirCores. Only three??? Indeed, the second flight string had only one slightly larger AirCore with longer tubing and a larger-diameter tubing on the upper-atmospheric end of the AirCore so that we could get a more detailed profile from the stratospheric part of the column. 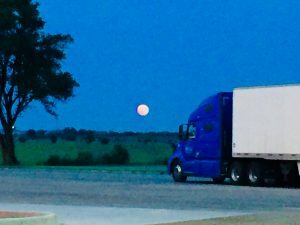 “Blood moon” observed while stopped for dinner on the way to Park Falls. Finally, just before 7pm, we crammed ourselves into the GMC Yukon — it’s an XL, but we really needed an XXL — fully loaded for the first time with all the equipment and three people and their luggage, and made the 4-hour drive up to Kansas City so Bianca could fly back to Colorado in the morning.